There are a lot of complaints that speech recognition—the ability to dictate to your computer—is geeky technology. But I think the very opposite is true. How geeky is it to hack on a keyboard to make your computer understand what you are trying to say? It makes so much sense to be able to speak to your computer, dictate text, and navigate through programs. The only geeky part about it is that we’re not used to it and that it works—kind of. Though I like speech recognition, I am not a “purist.” I use it only when I think I need to speed things up, when I have a text that is well suited, or when my fingers just don’t work the way I want them to. Even when I use it, I don’t unplug my keyboard or refuse to use it. Some things are more practical to do on the keyboard, and this is particularly true if you need to switch between languages, which obviously is quite common for translators. The program that I use—Dragon NaturallySpeaking—supports at least the native language and English in the Dutch, German, Spanish, Italian, French, and Japanese editions; however, unloading one language and re-loading the other takes at least a couple of minutes. So, which texts are well suited—or better, which texts are not well suited—for speech recognition? The answer depends partly on your translation subject. In mine it is mostly texts with a lot of proper names and/or loan words. This does not mean that you can’t teach the program to recognize proper names and loan words, but it’s one of those judgment things: If you want to use speech recognition to become more effective, you’d better make sure that you truly are. If you spend an hour to train it to recognize new terms before translating for an hour and a half on a job that would otherwise take only two hours, that seems like wasted time to me. On the other hand, if I can expect that these proper names and loan words will occur in future projects, I may just as well spend the time to train. My first rule for success with speech recognition software will probably have the “purists” shaking their heads in agony. Having used the software for some time, I know the weak spots of my speech engine. Rather than using the “correct” function again and again, I prefer to type problem terms even while dictating the rest. My next rule: Take time to get used to not “thinking with your fingers.” Instead, preformulate longer segments and then speak them coherently for better results. This goes along with the next: texts that are not suited for speech recognition are those with a lot of formatting, because it’s hard to say them naturally. Depending on what translation environment tool you’re working with and how formatting is handled, it may be easier to use keyboard shortcuts for those that you are used to. If there is really a LOT of formatting, it may be easier to just type the whole thing. There is no formatting function that your speech recognition can’t do. That is, if you have the right version. When it comes to Dragon NaturallySpeaking, the Preferred version comes with all basic formatting in environments like MS Word or DragonPad. When you use a translation environment tool that makes you work in an interface other than Word, you will have a hard time doing everything with voice commands unless you have the Professional edition, in which you can easily write macros with virtually unlimited possibilities. The problem is that while Preferred has a relatively modest price tag, Professional does not. Once you have Professional, you can pay premium prices for upgrades because you are interested in the slightly better recognition that comes with each new version, or you can go cheap, downgrading but then losing all your macros. Windows 7 also contains an internal voice recognition program for Chinese, Japanese, German, French, Spanish, and English. This feature has suffered criticism, but I was impressed with its accuracy and user-friendliness in tests that I ran. I dictated the same paragraphs in both programs and had only slightly worse recognition in Windows than in Dragon (96% vs. 98%). Unless you are an awesome typist and refuse to change that geeky habit of exclusively using your fingers to enter text, speech recognition is a great alternative way to “type,” even before carpal tunnel syndrome hits. Google Translate also includes a virtual keyboard. 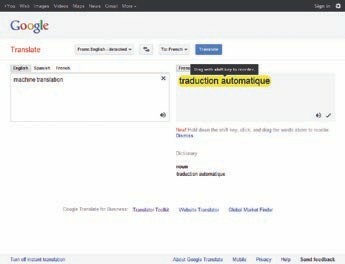 Much discussed is the new user-pay version of the Google Translate API, in contrast to the free Google Translate Toolkit, or even the Google Translate website. It has gotten some interesting changes lately, including newly added virtual keyboards. Some translation environment tools have already started using the new version of the Google API—including memoQ and Wordfast—and if you are intent on using Google Translate with those tools, you can find a video how to register and pay for it at Google. If you use a tool like IntelliWebSearch you can use GT for free because IntelliWebSearch retrieves data from the Google Translate webpage. You can find a description of how to do this here. kim posted this article under Announcements	on Sunday, January 1st, 2012 at 12:01 pm	You can follow any responses to this entry through the RSS 2.0 feed. Both comments and pings are currently closed.